Lydia's back, and strange things are afoot! Hello, gentle readers! It is I, Lydia, returned from Africa. I shan't be working regularly here in the store, but Doug has asked me to resume blogging duties as long as I am around Chicago, so you can expect my bright shining typeface semi-regularly for at least a few months. Yes, this means that my entire role at O'Gara and Wilson right now is to find entertaining things around the store and blog about them. Fear me! 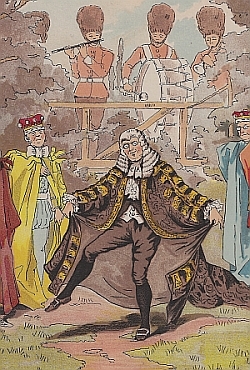 This comes from an 1883 illustrated play titled "A Parody of Iolanthe", written by one D. Dalziel, who apparently edited some sort of theatrical newspaper at the time. 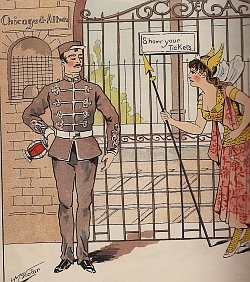 "Iolanthe", as I learn through the Internet, was a Gilbert & Sullivan satire that played in the early 1880s. 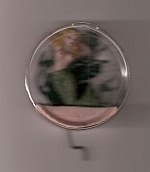 It featured fairies messing about with the House of Lords. 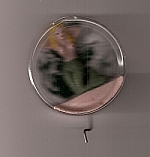 So Dalziel's "A Parody of Iolanthe" features fairies messing around with ... railroads. Queen: The comfort of your passengers must be your primary consideration. (Very solemnly) You will also be forced to run your trains according to your advertised time-table. All: (shriek) Oh, spare us! Spare us! How could that cruel Queen force the trainmasters to run on schedule? How terrible! Presumably many railroad historians (or Gilbert & Sullivan fans) are vying for this book, because ours is the cheapest available copy at $495.00. Far beyond my ability to afford, alas, but I'm glad I got to look at the pictures of dancing Olde Worlde lords. Yes, indeed: O'Gara & Wilson has the all the 1976 issues of "The Michigan Polka News". All these issues have been pulled together in one tall binding, which I would show you except that the book was too big to fit in the scanner (I could only fit one corner of the News itself, as you can see above). 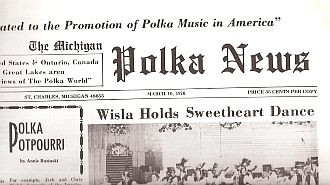 The Michigan Polka News did not merely feature Polka Band Calendars, but also Polka Tidbits, information about Polka Sprees for Charity, discussions of the Origin of the Polka, various polka contest winners, and the stories of polka heroes. Our collected 1976 "Michigan Polka News" issues will cost you only $60.00, my friends, and every page is in beautiful condition. Where else in the world could you find such random things? Nowhere, gentle readers. Nowhere. That's why you keep coming back to O'Gara & Wilson, and we love you for it. See you soon!